An alphabet of pioneering princes—from A to Z—by the acclaimed Austrian designer Willy Puchner Meet the princes from A to Z. Some are ambitious, some bold, some daring and dashing . . . but each of the twenty-six frogs are striking in character and charm and come bearing extraordinary gifts and talents. Puchner’s opulent and incomparable illustrations make this abecedary a marvel for all ages. Willy Puchner, born in 1952 in Lower Austria, works as a photographer, designer, and author in Oberschützen, Vienna, and beyond. After studying philosophy and history, he followed his desires and visited distant cities: New York, Sydney and Paris, Venice, Tokyo, Honolulu, Rome, and Cairo. He has published numerous books, shows his paintings in exhibitions, publishes in magazines, and leads workshops and lectures. 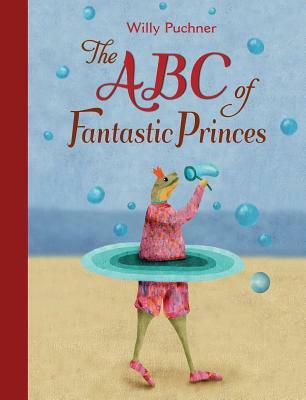 Puchner’s The ABC of Fabulous Princesses and The ABC of Fantastic Princes have been praised for their inventiveness. This is his third book for NorthSouth Books.